If there's one thing that I've been giddy about this December - it's vests! Perfect in cool or snowy weather, they're truly your best friend during this transition into Winter. I've worn this on simple errand days and dressed up when I attended my daughter's first dance recital a couple of weeks ago. Madison performed amazingly for her first time and I quickly figured out that she loves the spotlight! That's my sassy Madison for yah and I couldn't have been more proud! These are the moments that I really look forward to as a mama with young kiddos. They're finally old enough to where I can enjoy watching Austin's football games and seeing Madison dance her heart out in Ballet and Hip Hop. While they're still young (ages 6 and 9), I want them to participate in a variety of extracurricular activities to see what most interests them. It makes them more well-rounded, encourages social skills, team work, all while staying active. It's a lot of running around for me, but that's why I have great pieces like this to wear, no matter the occasion. 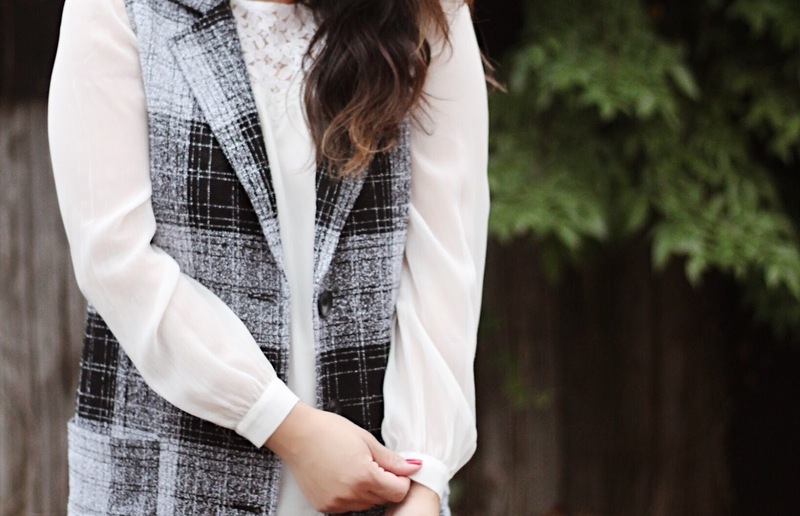 What I love most about this vest is the extended length to a traditional style vest. 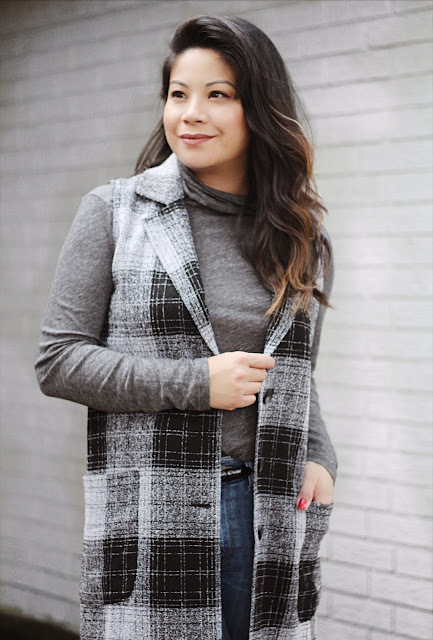 This trend of lengthened cardigans, vests, and coats are something I've embraced wholehearted, as it's flattering, gives me the appearance that I'm taller, and is a nice modern take on a classic piece. 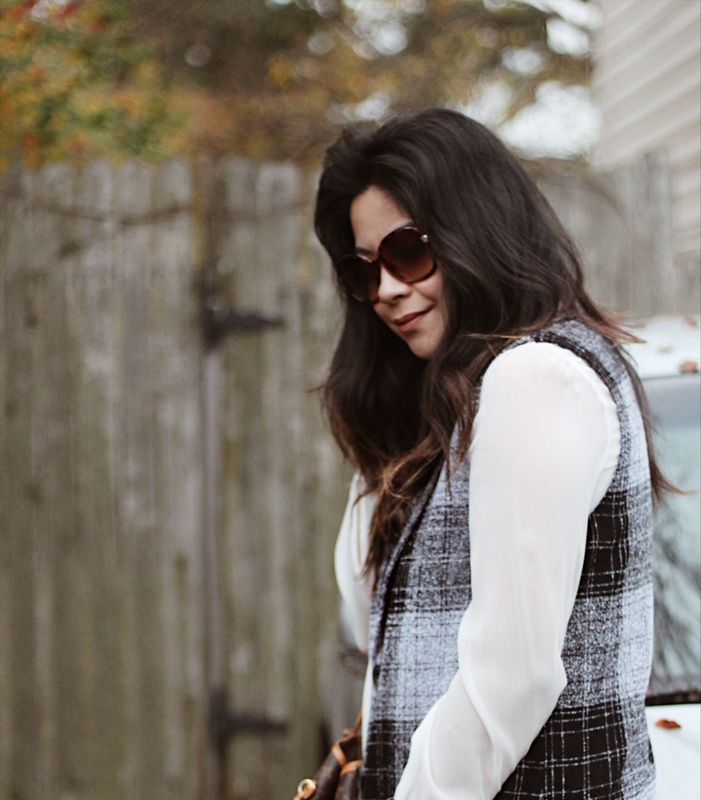 Here, I have worn this long vest two ways to show it's versatility. The first look is dressed up for days at work, attending church or joining friends for dinner. You can even wear this belted, which also looks amazing. The second look is perfect for casual days. 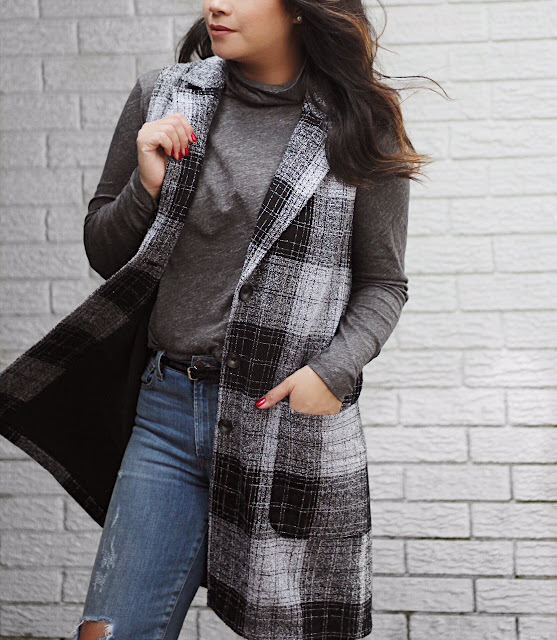 Along with a lightweight turtleneck and jeans, you can elevate your look with one simple piece. 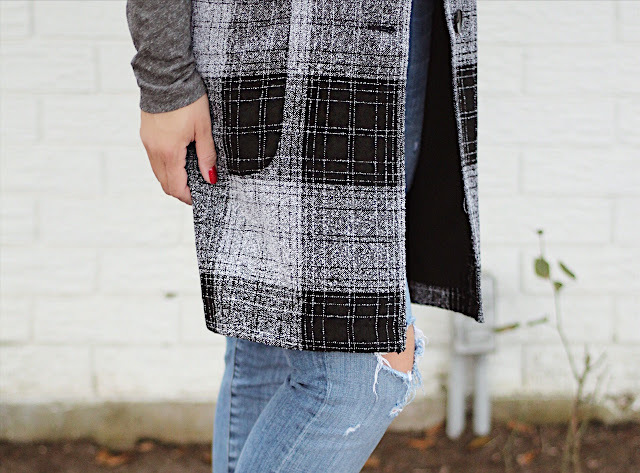 Flats, hunter rain boots, and booties all compliment well with your favorite pair of jeans. Keep reading below for more details and other long vest options to check out ... which many are currently on sale! 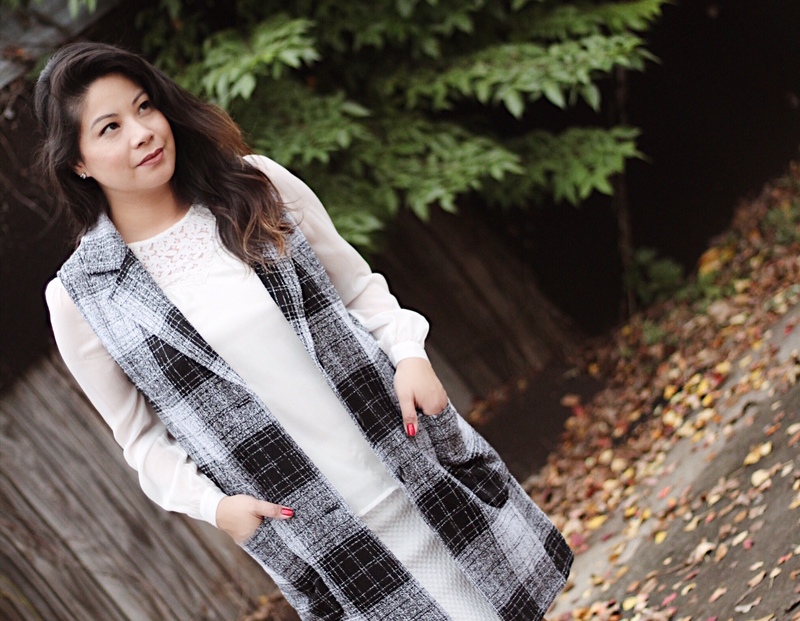 Here are some other vest options, definitely worth checking out! Many are on sale, so take a peek and believe me, you'll love this long vest trend too! Merry Christmas and Happy Holidays everyone! I hope you all had a wonderful holiday weekend with family + friends, your pets, or solo. This year we stayed in Houston, in lieu of traveling to California to see my side of the family. I was completely on board with that, as it just comes with the territory of moving far away from home. Christmas was indeed a lovely time here, filled with the simple joys of each other's company and relaxing while watching the kids play with their gifts from Santa Claus. Everyday prior to this, I was a busy elf running around searching for the perfect gifts for all our loved ones. So after church, my hubby and I plopped onto the couch with the feeling of "we did it!" It's so funny how chaotic it can be for parents during the holidays. It's quite a production creating a special Christmas, memorable for the kiddos. But it's all worth it when you see the huge smiles on their faces! Truly priceless! 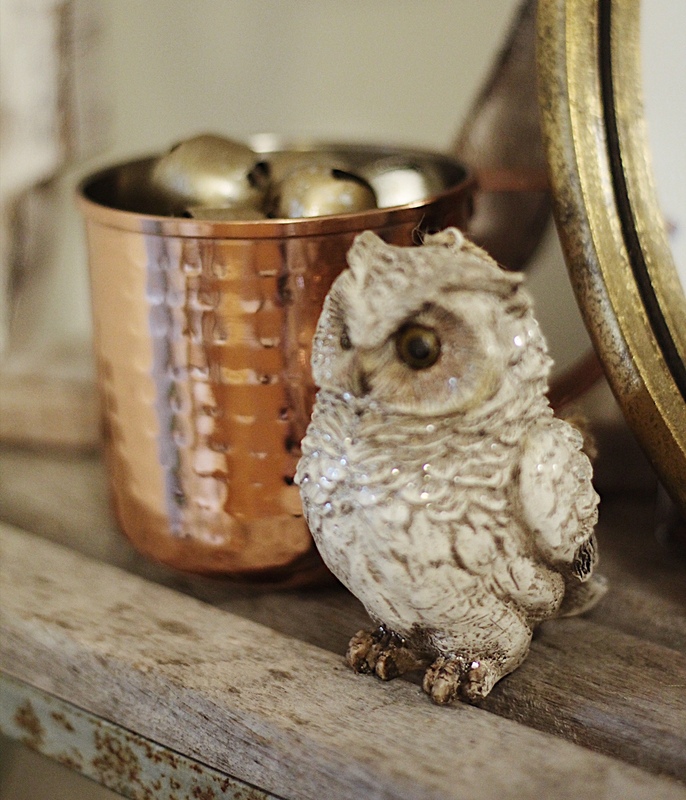 The beautiful patina of this vintage bowl, adds loads of charm and character to this table display. 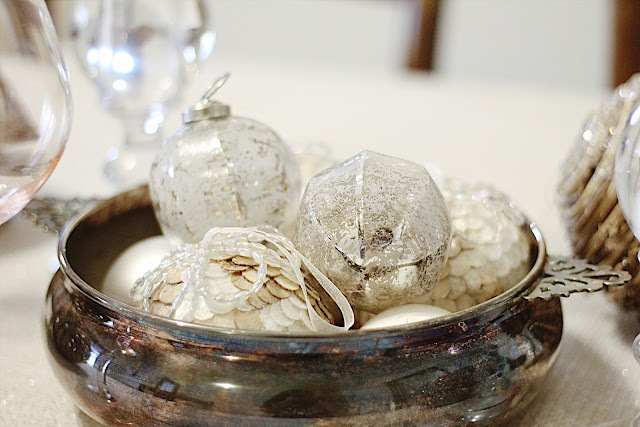 I also added these Mercury Glass and Capiz Shell ornaments for a vintage touch. 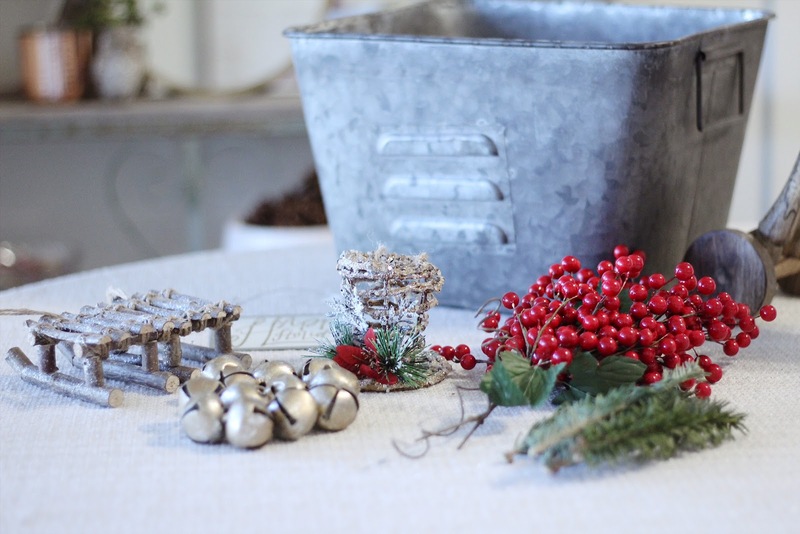 I love incorporating decor in unexpected ways, such as filling up flower pots and copper mugs with ornaments and jingle bells. 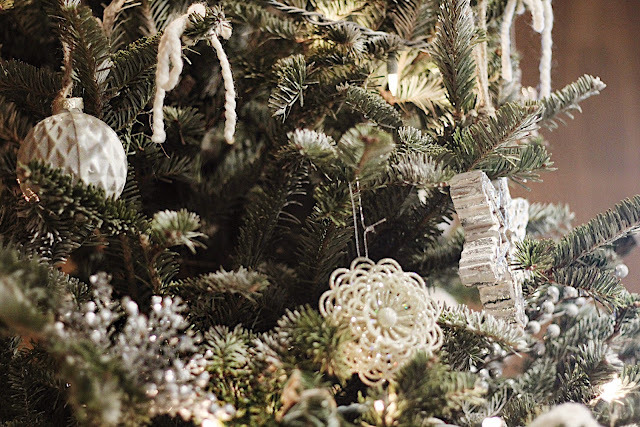 Ornaments of all kinds, glittered berries and velvet + yarn bows. The places I enjoy shopping at for holiday decor is: Hobby Lobby, Target, Anthropologie, Nordstrom, and Marshall's. 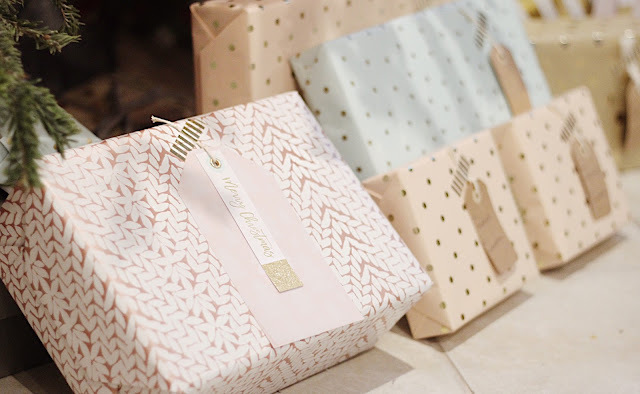 Rose Gold and Metallic Gold also shined throughout, from the wrapping paper to the washi tape and gift tags. 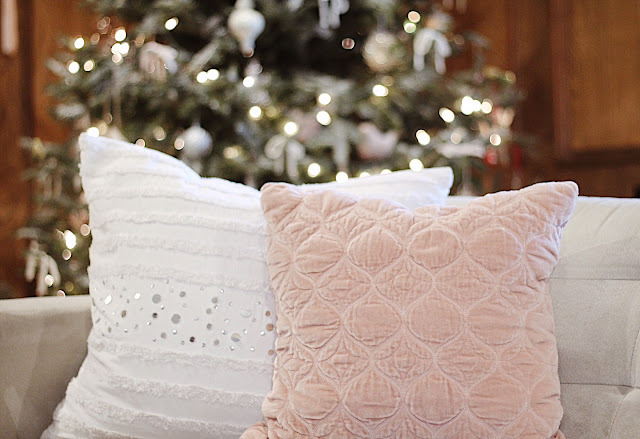 My favorite DIY this season! I took a 5 foot sequined leaf garland that I purchased from Marshall's for $14.99, and cut it in half to create 2 wreaths to display in the living room. 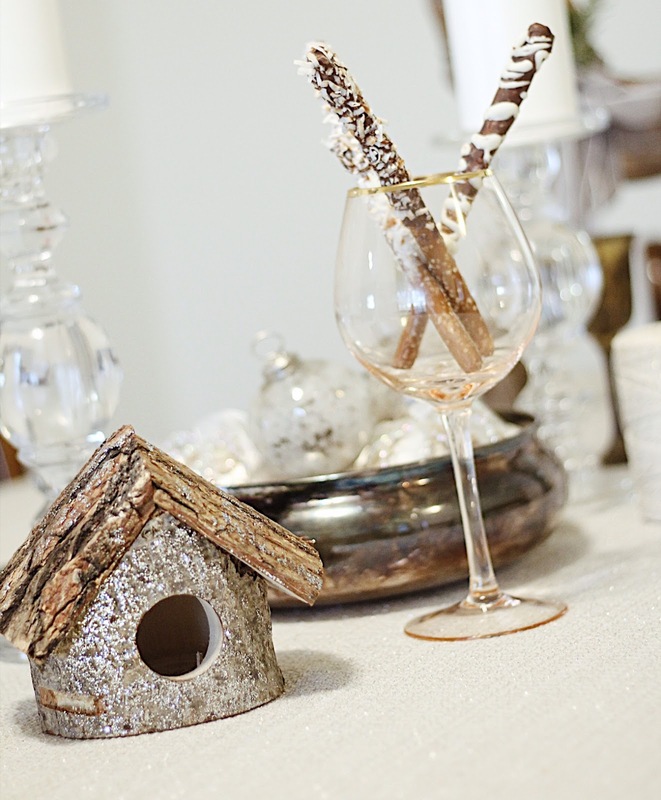 They were topped off with velvet blush ribbons to finish the look. Absolutely beautiful! This blush coat from Anthropologie was a gift from my husband last year for my birthday. I adore it so much and love wearing it during the holidays and on special occasions. The bell cut flair from the waist down is so unique and flirty! I could twirl in this coat all day! J. Crew "Martina" metallic gold wedges that I wore for my wedding a few years back. I hope you have a very Happy New Year and chat with y'all very soon! 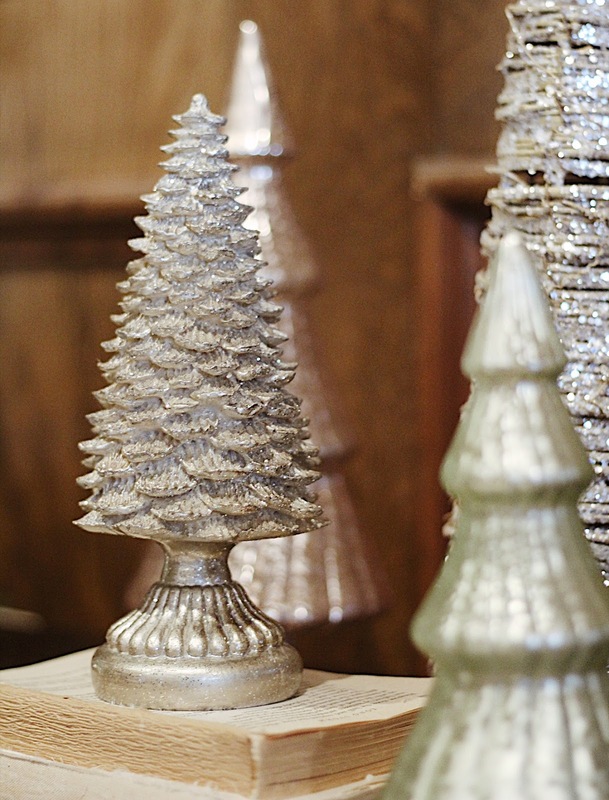 Can you believe that we're only a few short days away from Christmas! My goodness, how time flys! Between holiday shopping and Christmas parties, December has officially become the quickest month of the year. 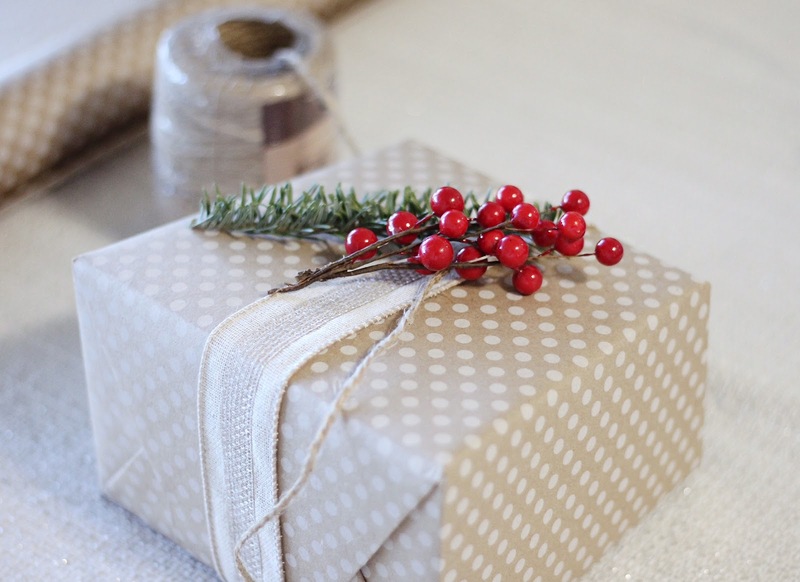 Like many of you, the gifts are nearly all bought, but are all waiting to be wrapped. 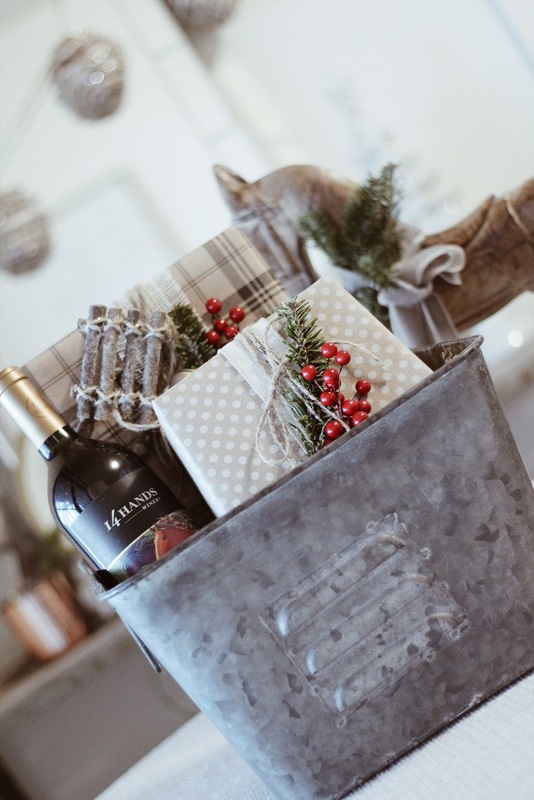 Aside from what's inside, receiving a beautifully wrapped present is warming to the heart and makes unwrapping more special. You can make the simplest of gifts look amazing and expensive with just a little extra details. 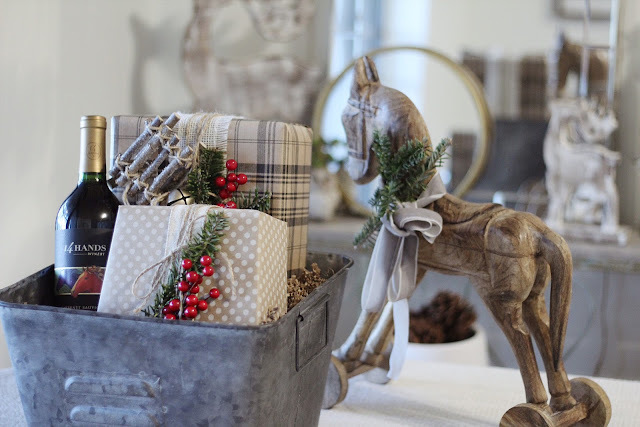 Since I am putting together a few company gifts for my husband's shop today, I thought I'd take you along with me as I put these modern farmhouse gifts together. Below are some ways I like to package gifts, no matter the theme, and I hope you like them! Usually during the week of Christmas, holiday decor is marked down even further, making it the best time to shop for wrapping paper and accessories. 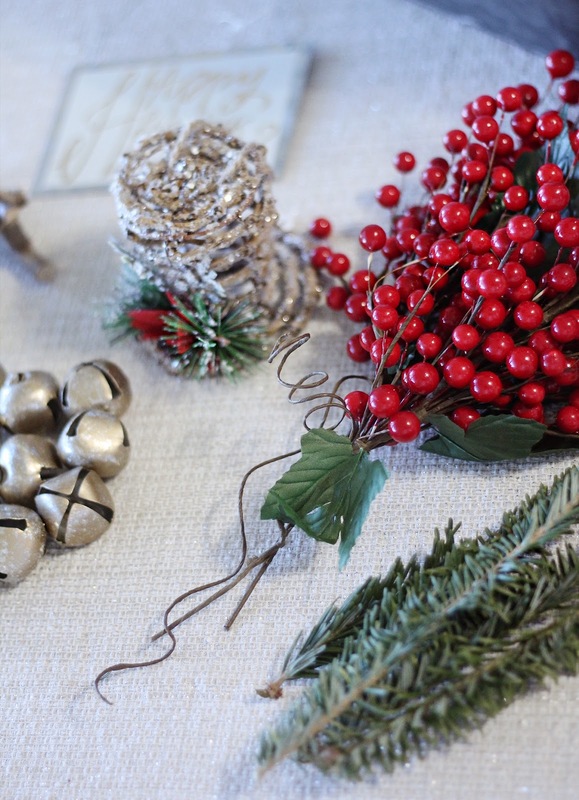 I purchased these faux cranberries, ornaments, burlap ribbons, and bells for 66% off from Hobby Lobby. To add a touch of freshness, I took a few branches from our Christmas tree to add to the gifts. 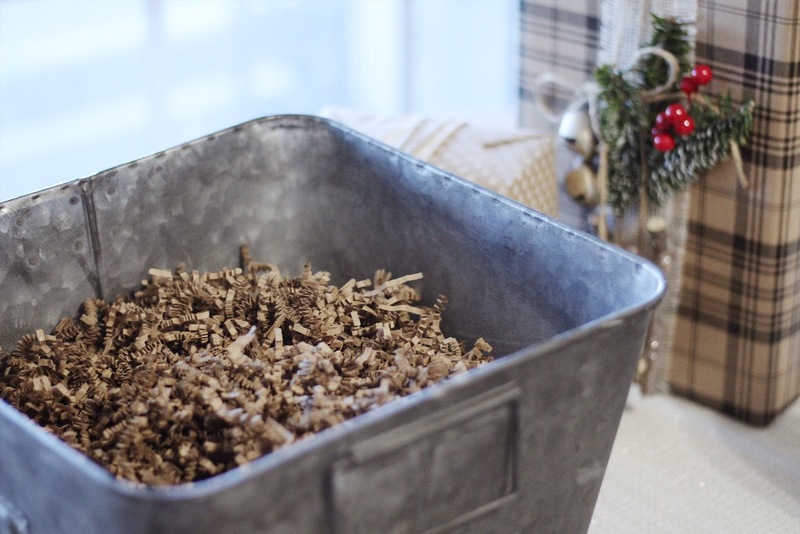 Using sprigs of rosemary or eucalyptus leaves are other great options. 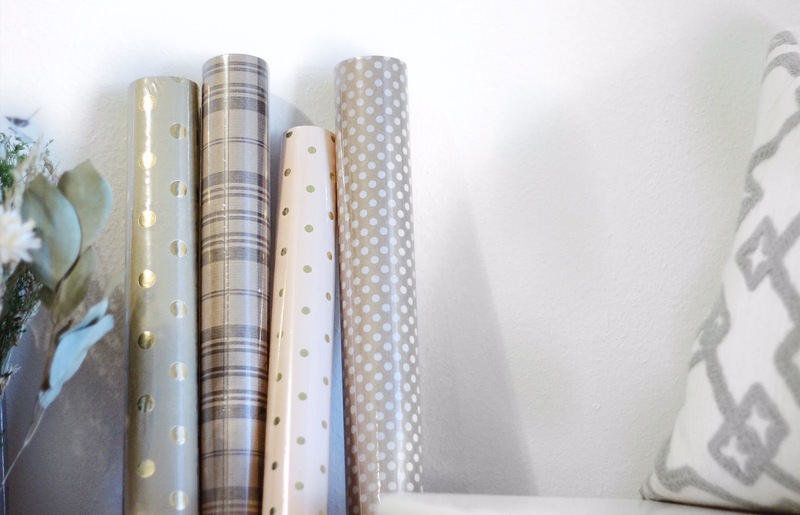 Neutral wrapping paper is something I really enjoy using because you can use it year after year, even when your color theme changes. Just use a different bow or gift tag to match your theme for the occasion. 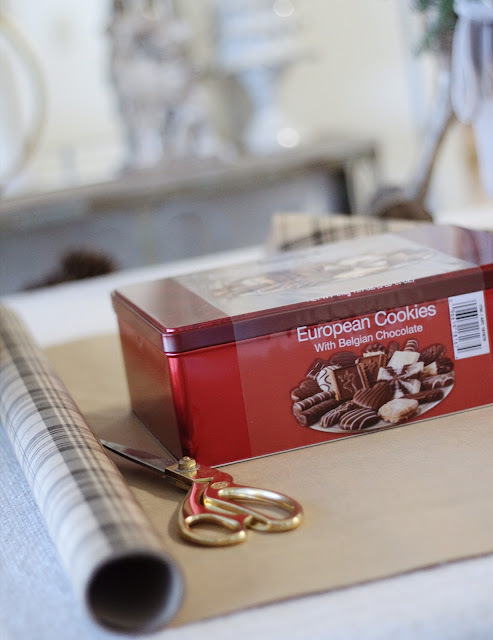 For a polished look to your gift, make the edges crisp by running your fingers along all the edges of the package to add definition. It's a simple trick, but it truly makes a difference. 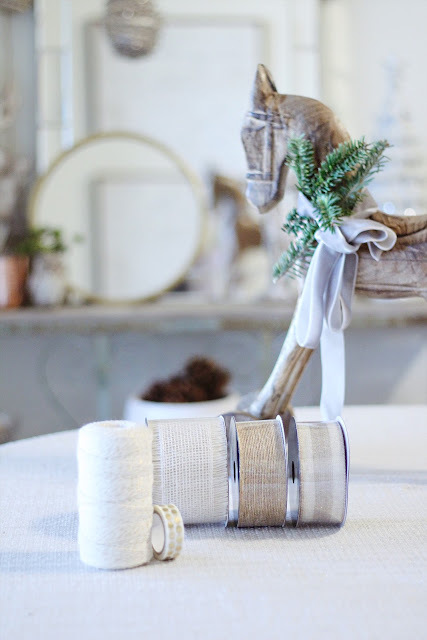 Work with different ribbons, twine, and toppers to see what looks best. 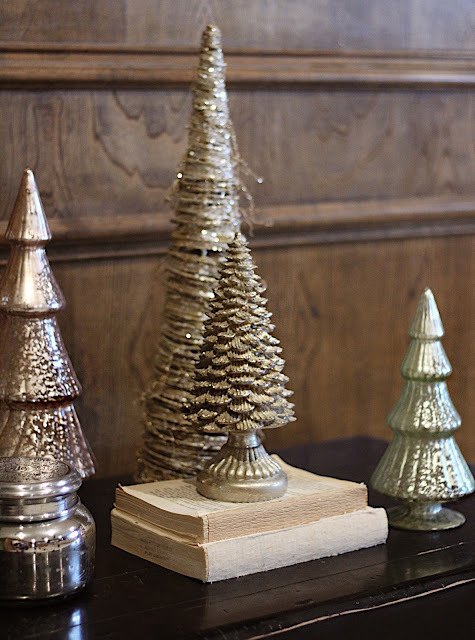 I like using Christmas ornaments where I can, as they make a really nice keepsake for your giftee to use on their own Christmas tree. For a more organic look, I added a dark kraft paper filler to this vintage style bucket, before adding in the gifts. 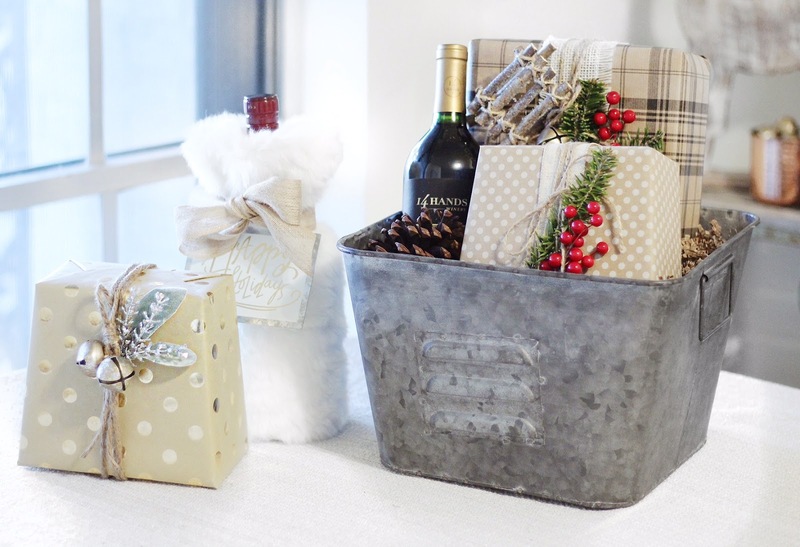 Wine gift? 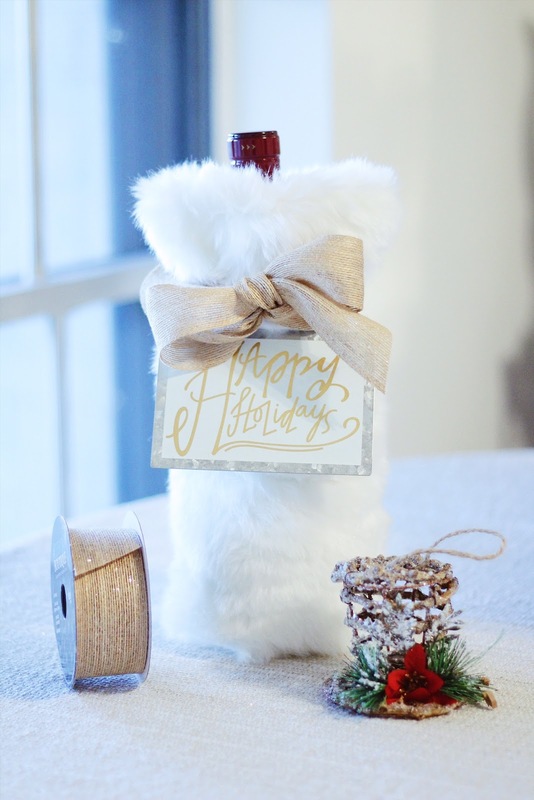 A faux fur wine cover is perfectly modern & chic! 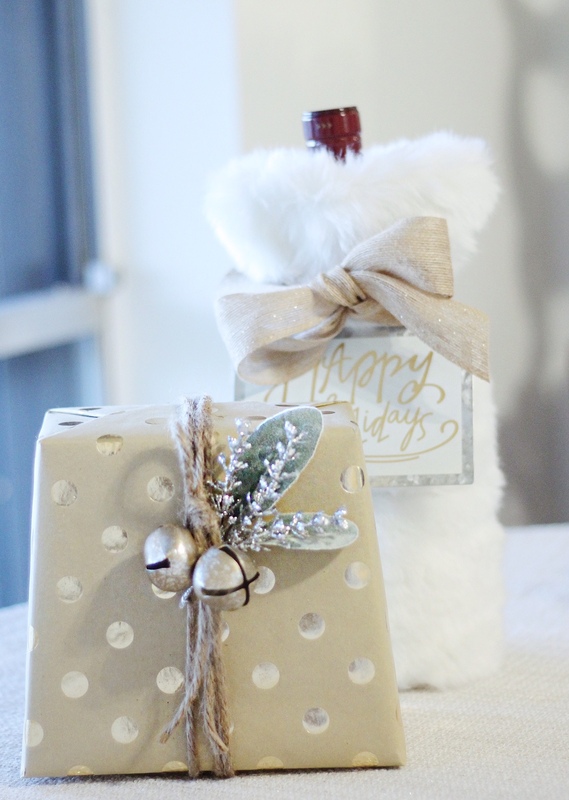 It looks so pretty wrapped in this glittered burlap ribbon and I added a galvanized ornament as a gift tag to complete the look. 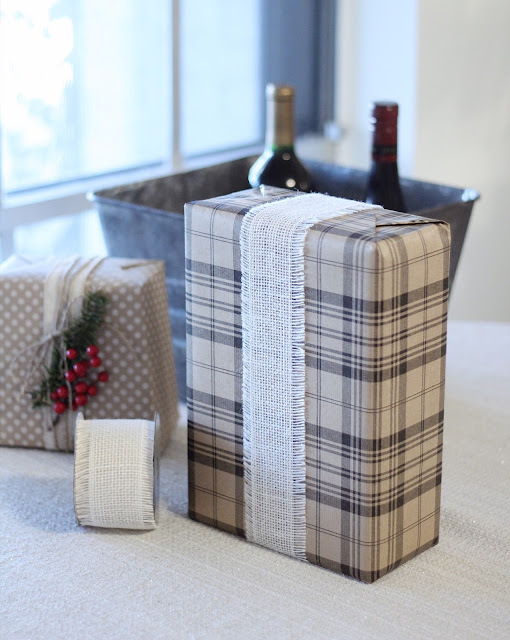 Gift wrapping is one of the most favorites things I LOVE to do! Even with my two Etsy shops, packaging is a very important part of my business - which is where the "Sprinkles" in Pretty with Sprinkles comes from. 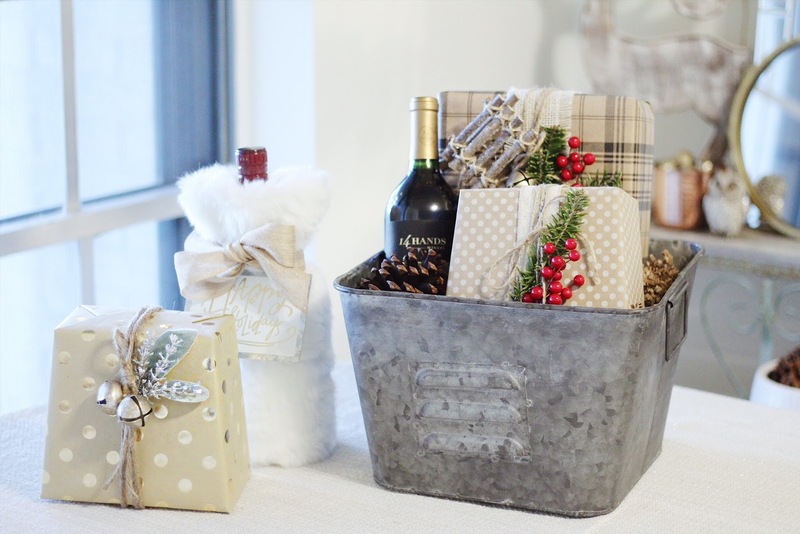 So have fun - pour yourself a glass of wine and put on your favorite show, while you pretty up your gifts! A Californian living in Texas, sharing my love for florals, vintage finds, and a romantic meets southern charm style.